He holds M. Phil degree with major in Commerce & Finance. The area of interest for teaching & research is Finance but when specific field in Finance is talked about, it is Public Finance (with special reference to taxation), International Finance & Business, Business Finance and Islamic Finance. 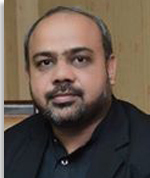 He is in teaching profession since 2002 and has been serving since Feb 2009 to Hailey College of Commerce, University of the Punjab. Presently teaching and supervising research activities at graduation and post-graduation level.